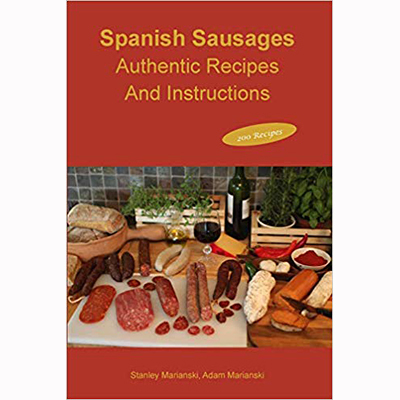 Home > Books, Videos, Posters & Charts > Cook & Recipe > Book "Spanish Sausages"
Spanish Sausages - Authentic Recipes And Instructions is the first book written in English that describes Spanish Sausages, their origin, composition and instructions for making them. Written by Stanley Marianski, with 13 books to his credit and known for writing first of its kind books like “The Art of Making Vegetarian Sausages” or “The Art of Making Fermented Sausages”, a classic that has introduced thousands of people to making salami type sausages. This book unveils secrets of sausage making as practiced in Spain for centuries. After reading the book the reader will know the differences between Chorizo, Longaniza, Salchichon, Fuet, Morcilla, Butifarra, Salchicha, Sobrasada, Sabadiego, Chireta, Fiambre, Androlla, Butelo and many others. Spanish sausages are found, in different variations, all around the world.